The United States has over 12,000 miles of coastline and some 72,000 miles of coastal waterways that are affected by tides and tidal currents. Even if you are an inland boater, you may travel to an area where knowing about tides and tidal currents is important. The seminar deals with how the sun and moon create tidal patterns, sources of information about tides and tidal currents, simple ways to predict height of tide and speed of current flow and how to use both print and electronic tide tables. 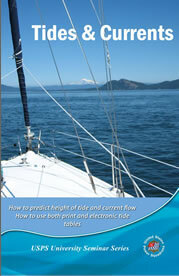 Learn about tides and currents from experienced coastal boaters. Each student receives a full color Student Guide for the seminar.